Now that it's October, I really have to haul on this project. I've got 2 months to finish it (maybe 2 weeks in December) and I'm a month behind schedule. By the end of this month, I'm hoping to have the Squid fight, Finale, and Vulcania drawing completed. I am devoting the entire month of November to finish off the entire project and install the walls and viewing windows to clean everything up. Also the path will be themed with special ceiling treatments, appropriate lighting, numerous pipes and gauges, and countless rivets. The big news this week was the installation of the structure for all the scenes on the left side of the path (Burial scene, Organ scene, Squid fight). I wanted to get to the structure for the finale scene, but I decided to wait until I actually make the scene. Here's a shot of the structure for the three scenes, which took a lot of time to engineer because of the complex angles and heights required for each set. The blank piece of foam core is where the Squid fight will be going. 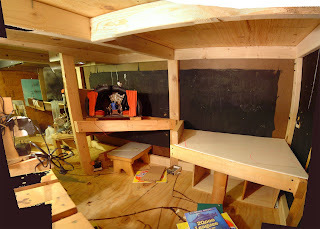 The 2X4 at the end of it is where the viewing window will be (complete with water drenching across it; I figured out how to do that without making a mess). The organ scene is completely finished; there could be more details, but I'm not going to fuss around with it anymore since it took way too long to do. This week I might start on the installation of the entrance and exit doors. These will be automatic motorized doors unlike my typical strips of trash bag. These will help make the project less amateurish and it helps control "guest flow" for family gatherings. These will be sliding doors unlike my original plan for swinging double doors, because they take up a lot smaller footprint. 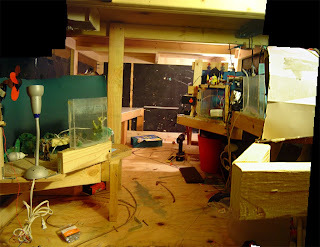 To finish off this post, here's a quick shot of the inside, with the Dinner scene on the immediate right, Burial scene on the left, shark attack scene on the right towards the back, and a little bit of the future squid fight in the very back.